Scotland boss Gordon Strachan could make Scott Arfield’s dreams come true with a full international call-up. Strachan’s assistant Mark McGhee has revealed that the Clarets midfielder, along with Fulham defender Jack Grimmer, are on their radar as they ponder their selections for their next squad. McGhee has watched Arfield this season, and the Livingston-born player admitted before scoring in the 2-1 win over QPR a fortnight ago, he remains hopeful of a call: “I’ve never hid away from the fact that I would love to play for my national side and if the chance came it would be great. “It would be the proudest moment of my career. “Where I’ve come from it would be a tremendous achievement and something I’m striving for. “I’ve not had any discussions or any conversations or anything liked that. Arfield has represented Scotland at Under 19, U21 and B level, but has yet to earn senior recognition, despite his form for Burnley over the last 18 months. But though McGhee admits the 26-year-old has a tough job to win a place in a packed pool of Scottish midfield talent, he has been impressed with the former Huddersfield Town man ahead of Scotland’s next European Championship qualifier against Gibraltar at Hampden Park on March 29th, and the preceding friendly against Northern Ireland. McGhee said: “I have been a couple of times recently to watch Scott Arfield at Burnley. “He and Jack Grimmer are boys who are getting good reviews down the road and who therefore deserve consideration. Now what they have to do is displace people who are already there. “One of the most difficult jobs is for the likes of Scott Arfield. “In the middle of the park we have Scott Brown, Charlie Mulgrew, James Morrison and James McArthur, a group in our strongest area of the team, so he has to get in ahead of them. 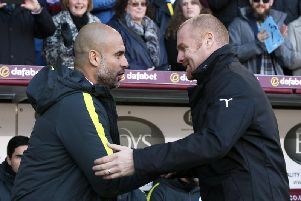 “And even if you play him in a wider role where he plays a lot for Burnley, you then have the likes of Graham Dorrans who is doing well for his club.